Distribution and habitat: Ceratophyllum demersum is native to North America but nowadays having a cosmopolitan distribution in temperate and tropical regions. Ceratophyllum demersum is declared weed Australia and is classed as an unwanted organism in New Zealand. Description: Ceratophyllum demersum is a submersed with no roots, so is free-floating perennial plant. 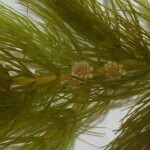 The stems reach lengths of 1–3m (3-10 feet), with numerous side shoots making a single specimen appear as a large, bushy mass. The leaves are produced in whorls of six to twelve, each leaf 8–40mm (0.3-1.6 inch) long, simple, or forked into two to eight thread-like segments edged with spiny teeth; they are stiff and brittle. It is monoecious, with separate male and female flowers produced on the same plant. 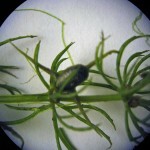 The flowers are small, 2mm (0.08 inch) long, with eight or more greenish-brown petals; they are produced in the leaf axils. The fruit is a small nut 4–5mm (0.1-0.2 inch) long, usually with three spines, two basal and one apical, 1–12mm (up to 0.4 inch) long. It can form turions: buds that sink to the bottom of the water that stay there during the winter and form new plants in spring. Care: Ceratophyllum dersum grows in still or very slow-moving water. Generally floats during the warm months if allowed, but may be potted and submerged. Sinks to the bottom of the pond during cold weather if allowed to float. Ceratophyllum demersum is fast growing plant. Light: Ceratophyllum demersum’s light requirement is part shade. Temperature: Ceratophyllum demersum grows in lakes, ponds and quiet streams with summer water temperatures of 15-30°C (59-86°C) and a rich nutrient status. Propagation: Ceratophyllum demersum natural propagate through seed that sink to the bottom of the water and stay there during the winter, forming new plants in spring. Also Ceratophyllum demersum can be propagated from plant fragments. Uses: Ceratophyllum demersum is often used as a floating freshwater plant in both coldwater and tropical aquaria, being free-roots plant or it may be attached to the substrate or objects in the aquarium. 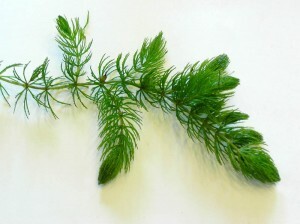 Its fluffy, filamentous, bright-green green leaves provide an excellent spawning habitat for fishes. Interesting facts: Ceratophyllum demersum has allelopathic qualities as it excretes substances that inhibit the growth of blue-green algae (phytoplankton and cyanobacteria). 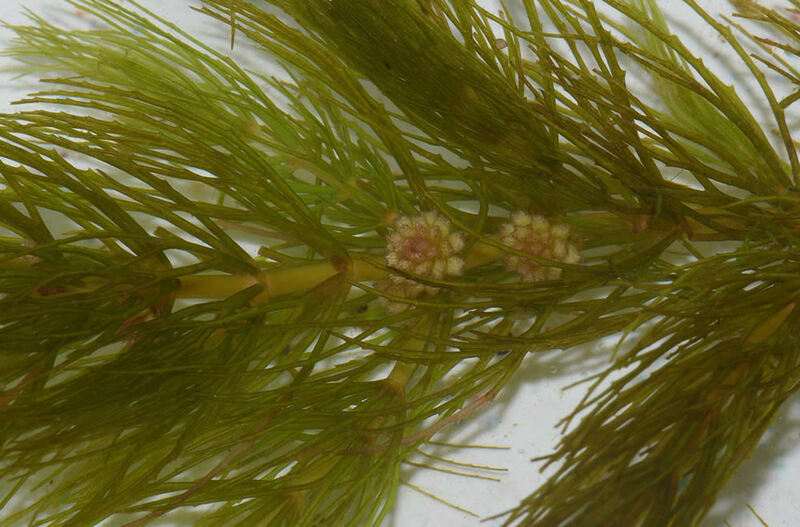 Ceratophyllum demersum may be confused with non-weedy Ceratophyllum echinatum, which is more delicate, bright green, usually grows in deeper water, and has 3-5 lateral spines on the fruit. Also Ceratophyllum demersum is similar to other bushy submersed plants such as: Muskgrasses (Chara spp.) 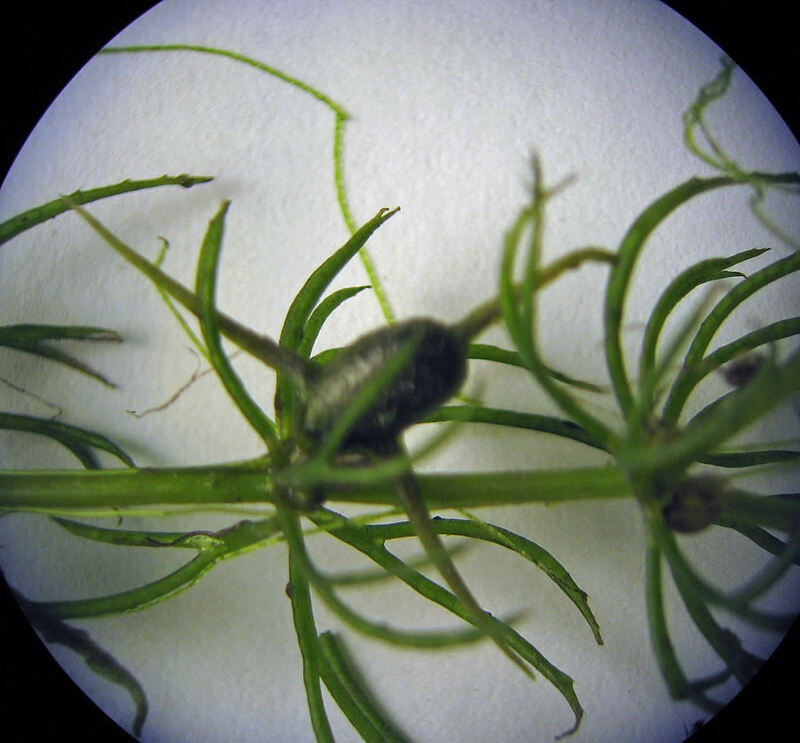 which are large algae and produce a skunk or garlic-like odor when crushed; waterweeds (Elodea spp.) which have whorls of broad flat leaves; and milfoils (Myriophyllum spp.) which have feather-like leaves. Note: Ceratophyllum demersum is an invasive species. Its dense growth can out-compete native underwater vegetation, leading to loss of biodiversity.